It looks like all of that stamping wasn’t for nothing, after all. I finally got a hit on a $2 bill. The actual hit comes from Hollywood, but it looks like the person got it not to far from the bank where I originally asked for it. I guess that people really do spend twos. I want to get more. Maybe I’ll ask for some twos later in the week. Pay day is coming up soon. I suppose it’s appropriate. This is the one-year anniversary of my joining Where’s George. Yes, it was one year ago today that I found my first wild bill. If I recall, I got it at Aventura Mall. The rest, as they say, is history. I also found some more interesting bills. One bill was one that I found a while ago, but for some reason, neglected to post. All I can say is that it’s purple. Beyond that, I can’t really say what it’s supposed to be. Is it a word? I don’t know. Maybe the aliens have finally gotten around to trying to communicate with us. I also found another bill, this time a twenty, with some more legible writing on it. In fact, it can actually be read from both sides. (The other side isn’t as clear, though.) What this person was trying to say to society is beyond me. I could never understand why people write random numbers, letters and phrases on bills. Do people really have so much money that they can afford to use it as scrap? 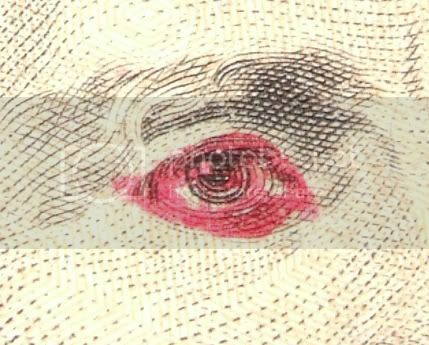 This same bill has the portraying of Andrew Jackson with a bit of red eye. They red eye may just be the result of boredom. It may also be some sort of covert message, such as people who photograph presidents have problems with their flash. Again, I’m open to comments with explanations. It almost looks like someone is trying to cross out the eye. There was actually another twenty with markings that I wanted to swap out, but I didn’t want to dump a lot of singles and the only twenties I had hadn’t been entered yet. Unfortunately, it went into the deposit, so it’s off limits now. I’m sure I’ll find more monetary oddities soon.